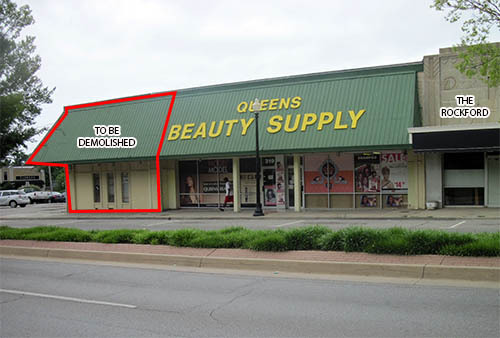 The owners of Queens Beauty Supply at NW 23rd and Hudson have submitted plans construct a new brick structure complete with public art, murals and an outdoor patio. Plans submitted to the Urban Design Commission for 323 NW 23rd Street show the proposed building to have 3 tenant bays with a drive-thru serving the largest space; OKCTalk has learned that Dunkin' Donuts is the likely large tenant. To make room, a long narrow long-vacant building to the west of Queens Beauty will be demolished. As the property to be demolished and Queens Beauty share the same green metal mansard roof, the remaining business storefront is likely to receive a makeover as well. 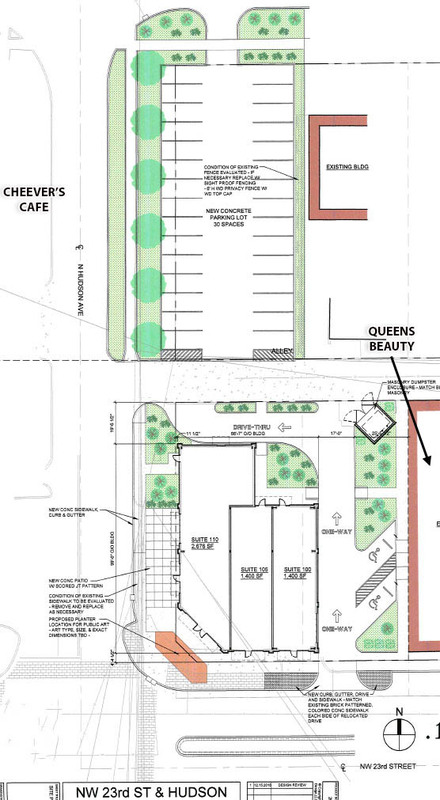 The plans also show the owners renovating the parking lot directly to the north which is directly across from Cheever's Cafe, one of the very first businesses to start the Uptown renaissance back in 2000. Since Cheever's opened, many badly maintained buildings along the former Route 66 stretch between I-235 and Classen have been renovated leaving the remainder more and more conspicuous. Significant renovations and additions to the Uptown 23rd District include The Rise, Guyutes, 23rd Street Courts, The Pump Bar, Pizzeria Gusto and Tower Theater. Projects in the planning or construction phases include Citizen's Bank, Joe's Pawn Shop and the Gold Dome. That's a nice try at a drive-through that would affect only one opening along 23rd... But I'd like to see at least 2-story development on new construction here. I like that it's pushed to the corner and will have a patio. BTW, DD would absolutely kill it here including late-night. It would be nice if they would bury the utilities while they rehab that parking lot. Good for Dunkin' Donuts, beating Starbucks to 23rd St. I'm not huge on the drive-thru aspect of this, but even so I am excited for this infill development. It will make that corner look SO much better! Very happy about this development. Not quite sold on the idea of a Dunkin Donuts, but then again I could easily be 'suade at 12:30am in a years time. Beats the similar-looking jeweler on Ollie.. Minh Man or something? I'm impressed to see the such a solid proposal without first being criticized by a design board. Dunkin' will be a great addition. Building permit filed today for this project. Should see work starting in a few weeks. So, if they're demolishing part of the building with the green awning, does that mean the awning is coming down even on the part that will remain? Not sure but to change it or remove it they would have to file another application with design review and that hasn't happened as of yet. Dunkin Donuts on 23rd still a go? My understanding is this proposal died several months ago. So construction starting, but no Dunkin'? I'm checking on this and will report back. this is 23rd Street. UPTOWN. look up and down the street..nothing of note says anything of this. avail yourself of the opportunity or don't do anything. go back to NW Highway with this crap. The Pump has a giant "Uptown" mural and that place is maybe the most popular community space in the area. Not saying what it should be called either way, but a lot of stakeholders seem to be promoting the name and have been for a while now. I secretly love the DD cruller best among almost all donut offerings. I for one welcome our new corporate overlords. On a serious note this is my favorite thing about Uptown development. It is truly a mix of uses. Hipster and low-brow and everything in-between. Yes there are the "cool" options (Bunker Club, The Drake and Saving and Loan) but so too are there options for fast-casual breakfasting (Old School Bagel), mediocre but family-friendly pizza (Pizza 23), a Cox store, Family Dollar, etc. The Plaza will always have more cool cred, but there is also a serious upside to the neighborhood in just being able to grab a donut or a bagel without waiting in line for 45 minutes. Too bad about the drive through though as this will further impede the walkability of 23rd (as if it needed any more detriments to walkability). My other unpopular opinion is that I hope Queens Beauty Supply never relocates. But alas, the Wig District is no more. You think Pizza23 is mediocre? I don't think you've actually had bad pizza then. Bad pizza does not exist. Only those with hate in their hearts can deny the inherent goodness of even the worst-constructed slices.